Unfortunately, in an education system that relies heavily on standardization, the word failure is ripe with negative connotations. As a parent, it may be hard for you to stomach the notion that it’s actually healthy for your child to fail. I’m not just talking about an “F” letter grade, but rather any circumstance where we fall short of a certain expectation. The fact is that each of these experiences can be tremendously valuable. Below is an excerpt from my book, Seriously, Dad?, which outlines a discussion between a father and daughter about using failure as a teacher. Dad: I’m so thankful for your willingness to use these tools. I’ve really noticed a difference in you lately; a very positive difference. Daughter: Thanks Dad. I’m ready to talk about Tool 6 now. Are you sure? I don’t want your tool belt to be too heavy. It might fall off. Oh, Dad. Even though you try, your jokes aren’t very funny. Well, your mom laughs at me, so at least someone thinks I’m funny! Okay, here we go. Tool 6 is: Use your failures as teachers. Okay, then think of your mistakes as minor failures. 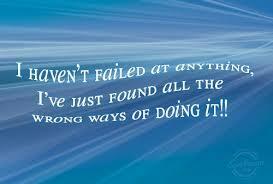 Well in that case, I’ve failed a lot. What? You’re glad I’ve failed. That’s not very nice. Hold on. Let me explain the tool first and hopefully you’ll realize that mistakes are a good thing. I want you to think for a moment about the last time you failed at something. Remember, I’m not necessarily talking about getting an F—I’m talking about a time you made a mistake or failed to meet your own expectations. For example, maybe you said something rude to a friend, and you realized later that you hadn’t said what you would have liked to have said. Oh, I’ve got a perfect example. Do you remember that persuasive paper I wrote about how we should have less tests in school? Yes, I do remember it. It was very well written. Well, I didn’t tell you this, but my teacher was so impressed by it that she decided to enter it in a contest for an education magazine. There were thousands of other applicants and I didn’t win. I was so proud of the article but I felt like a failure when I got the letter saying that it hadn’t been selected. So, the letter made you feel like a failure? Do you remember earlier when we talked about circumstances and how they are separate from us? Oh Dad, can’t you just let me wallow for a minute. Sure, you’re allowed to wallow all you want. I wallow sometimes as well. Your mom always reminds me that she isn’t accepting an invitation to my pity party, which helps me to realize that I’m choosing to wallow. But here’s the thing: I’m pretty sure that wallowing is not really an emotion you want to feel. You’re right. And yes, I remember when you talked about circumstances being separate from us. Perfect. So, in this case, the letter you got was a circumstance. Because we are not our circumstances, we have the power to interpret our circumstances in any way we want. You can probably guess what I’m going to tell you next. Yep. You’re going to say that I can choose my lens in any situation. I’m glad our conversation is sinking in! Your powerless lens would encourage you to see only the failure and consequently dwell on all that went wrong. You might blame the people at the magazine for their poor choice or you may even sabotage yourself for not being good enough. Regardless, the powerless lens will reinforce the idea of failure. Your curious/creative lens, however, will allow you to see the letter as a teacher. P.S. I recently received the following testimonial from a teacher in Indiana who just finished reading my book. He will be ordering a class set to use with his high school students as a means of teaching social and emotional intelligence. To order a copy of my book, please click here.